Can I get scrappage cash? | What Car? Can I get scrappage cash? Q) Does my X-plate Renault, which I've owned for three years, qualify for the scrappage scheme? 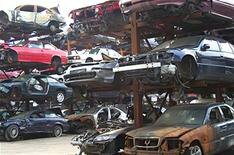 A) Unfortunately, only cars registered before August 31, 1999 qualify for scrappage cash. Since your car's an X-plate, it was registered sometime between August 2000 and February 2001.